The Shaw Festival’s last production of Shaw’s comedy Arms and the Man in 2006 was a disappointment because the director felt she had to add business to make the play funnier. This year the Festival’s latest production of Arms and the Man is also a disappointment, but for just the opposite reason. Director Morris Panych fails to bring out fully all the comedy inherent in the play. All he adds to the play is Ken MacDonald’s curious set design that, strangely enough, has no particular relevance to the play. Shaw’s 1894 comedy is set during and just after the Serbo-Bulgarian War of 1885 during which Bulgaria won the right to unify itself with the predominantly Bulgarian Ottoman province of Eastern Rumelia from which it had been artificially separated by the 1878 Treaty of Berlin. I mention the historical facts because the notion of a war between countries with unusual names in the Balkans makes people think that Shaw considered them merely operetta countries like Pontevedro in The Merry Widow. In fact, his mention of the Dragoman Pass, the Battle of Slivnitsa and the importance of Philippopolis (now known as Plovdiv) shows that he was quite aware of the details of a war that had occurred less than ten years before he wrote his play. In the comedy we meet Raina Petkoff, a Bulgarian girl given to romantic fantasies, who is betrothed to the narcissistic Major Sergius Saranoff. Both avow an ideal “higher love” to each other, but when the Swiss Captain Bluntschli, a mercenary for the enemy Serbian forces, bursts into Raina’s bedroom one night to escape pursuit, she soon falls for the man who carries chocolate instead of ammunition and he becomes her “chocolate cream soldier”. Meanwhile, Sergius seems keen on a bit of “lower love” with the family servant Louka, who is supposedly engaged to the servant Nicola. Shaw neatly pits the realists Bluntschli, Louka and Nicola against the idealists Raina and Sergius. Shaw’s comedy pointedly undermines heroism, patriotism and any sort of idealism associated with war. The bizarre notion that Panych and MacDonald have come up with is to turn the Petkoff’s house into a giant cuckoo clock. One side, which serves as Raina’s bedroom and the outside of the house, has carved ornamentation of a post-horn, crossed rifles, a stag and two woodpeckers. The is a central double door which is Raina’s shuttered bedroom window in Act 1 and the house’s central entrance in Act 2. In Act 3 set in the Petkoff’s “library”, the set is turned around so that we can see all the gears that turn nominally to open the double doors. Panych uses half of his Director’s Notes to justify the use of this design. The cuckoo clock is both ornamental and utterly practical. 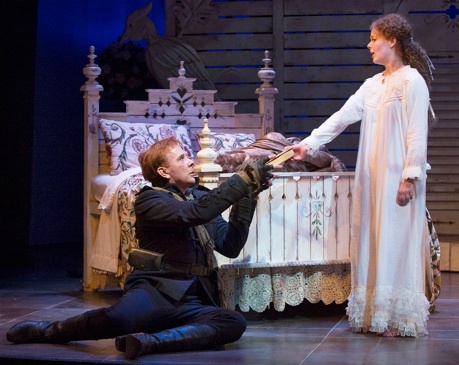 “Something more mechanical and prosaic” underlies the rousing sentiments of war. Also, the “absurdity” of living in a cuckoo clock links Shaw’s worldview to early surrealism. Panych and MacDonald find that the clock is “a theatrical statement that matches the quirkiness, humour and, ultimately, the precision of Shaw’s play”. These self-justifications are self-contradictory since they make the clock out to be both practical and absurd. Worse, Panych’s interpretation of the play seems to have stopped with the idea of the clock. Only once does Panych even use the clock as a cuckoo clock. In Act 2 when Sergius asks for her, the doors swing open and Raina pops in like a little bird about which Petkoff remarks,”She always appears at the right moment”. Otherwise, Panych’s use of the clock is totally inconsistent. 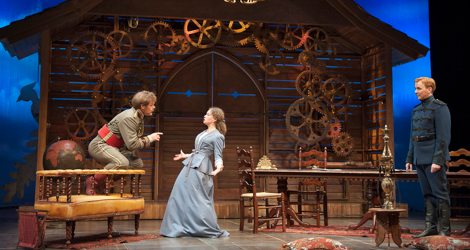 In Act 3, the gears first move when Catherine Petkoff presses her new electric bell. Afterwards, they sometimes move when the doors open, sometimes not. While a giant cuckoo clock house may be a fun idea, it is completely unsuitable for a play set in Bulgaria. What country, after all, do we most associate with cuckoo clocks? With the Switzerland of Bluntschli, and of chocolate and precision, not the Petkoff’s Bulgaria of 1885, known for poverty and imprecision. To make the Petkoffs live in such a Swiss-themed house, when they know nothing of Switzerland, makes nonsense of the play and of the practical-Swiss-versus-impractical-Bulgarian dynamic from which Shaw draws so much of the comedy. Indeed, Panych loses one opportunity after another to bring out the comedy in the play. Blutntschli’s hiding from the Russian officers inspecting Raina’s bedroom has been staged with much more tension and humour in the past. There is no payoff to the long set-up concerning the Petkoff’s “library” because our attention is attracted to the concatenation of clock gears rather than to the paucity of books in the room. Panych has Raina easily retrieve the signed photograph of herself from her father’s dressing gown rather than invent some of the complex manoeuvring that can make this task so amusing. Worst of all, Panych does not make the relationships between the characters clear. The “higher love” of Raina and Sergius is supposed to be comic, but Panych gives us only one example of their romantic posturing, even though Raina later admits that they do such posturing whenever they are in front of Raina’s parents. Panych totally misses Sergius’ heroic preening and oddly de-emphasizes Sergius’ repeated statements about what he “never” does even though they define his ridiculous rigidity. Panych’s view of the relationship between Nicola and Louka is too fuzzy. The comedy there should derive from how their engagement quickly devolves into what Nicola sees as more satisfactory – namely a shop owner-client relationship. Despite the farfetched set and the less than incisive direction, the play is buoyed up by generally high level of the acting. Chief among the cast is Graeme Somerville as Bluntschli. He is excellent at charting the character’s journey from fear, hunger and sleepiness to confidence to boldness during the course of the action. His diction and sensitivity to Shaw’s language are a model of clarity. Real-life husband and wife Norman Browning and Laurie Paton use their innate comic gifts to animate Major Paul Petkoff and his wife Catherine. Browning’s trademark sotto voce grumblings are always a treat and mark the Major’s awareness of what he can say in public and not. Paton’s Catherine is always willing to moderate her imperious tone if it is to her advantage. Claire Jullien’s Louka is the fieriest of all the characters and the one who wants most to break out of the social hierarchies that hold her down. Peter Krantz is ideal as her foil, a man inured to lowering his sights because he never gets exactly what he desires. Kate Besworth certainly looks the part of the romantic Raina, a 23-year-old who could be mistaken for 17. She is good at conveying Raina’s love of fantasy and has a fine moment near the end of the play when Raina finally comes down to earth to admit Bluntschli has seen through her. What she needs to do is to maintain both attitudes for longer through the action and to show us how Raina’s romantic self comes under enough strain that it is a relief when she embraces realism. Martin Happer also looks perfect as Sergius, and he could clearly play Sergius to the hilt if her were so directed. Unfortunately, Panych seems to have left him, like the rest of the cast to his own devices. As a result Happer’s is the least pompous and egocentric Sergius I’ve ever seen, and, consequently, the least funny. Sergius mode of behaviour with Raina versus Louka should be like night and day, but here Happer only marginally differentiates them. It’s too bad Panych has paid so little attention to such a richly comic role. But then Panych has paid too little attention to Shaw’s richly comic play. If only he had emphasized the wit inherent in Shaw’s text instead of treating the set as a substitute for close direction, this production with exactly the same cast could have been delightful. As it is neither this production nor that in 2006 has dislodged Jim Mezon’s production of 1994 from pride of place in my memory. Photos: (from top) Martin Happer, Kate Besworth and Graeme Somerville, 2014 Emily Cooper; Graeme Somerville and Kate Besworth, © 2014 David Cooper.